← June beetles: what are they, and how do I deal with them? Cockroach found in Joe’s apartment last week. Is it a problem? By far the most common question we receive is about infestations and having just found a cockroach in my house myself, I thought it would be a good time to say something about this. Due to the sensitive nature of this topic, I don’t feel comfortable reposting the inquiries. Infestations are something which understandably bothers people. They’re an invasion of privacy, an insult to our cleanliness, and can even give people lasting health issues like asthma. Plus, they’re a not so friendly reminder that our perfectly established barriers between “outside” and “inside” are easily bridged. Some insects, like bed bugs, even feed on us and can condemn people to live in agony until they’re gone. Bugs in your house can be really bad news, and it’s understandable why there are so many people who are afraid and frustrated. This can be compounded when multiple visits from experts and companies prove to be fruitless. However, even though we’re a blog dedicated to talking about insect biology-and normally don’t shy away from insect/human interactions-we’re really reluctant to deal with this topic. So we wanted to further explain why we’re so reluctant to deal with the subject of infestations. We also wanted to give people some pointers about what to do in order to find help with infestations, as well as give some very general tips about how to handle bugs in their house. We don’t want to discourage people from asking for help, but we do want to emphasize that there is only so much we can do through online interactions. Also…this will be a very, very long post because there’s a lot of good information crammed in here. Why are we reluctant to deal with infestations? There are two main reasons why it’s difficult to help people with infestations over the internet. 1.) You usually need information you can only get with a visit to the house, as well as knowledge of the local pest biology. Two very common flies which infest houses: coffin flies (left), and vinegar flies (right). If you look closely at the wings, you can see the differences in wing veination. Their behavior is also very different, with coffin flies preferring to scuttle about on the ground, and vinegar flies preferring to fly around the kitchen. Infestations, for reasons we’ll discuss later in this post, are very difficult to deal with if you can’t be there in person. You need to identify the type of bug which is in the house, and this is difficult without a specimen. Even if you have a picture, they’re not usually of high enough quality for us to tell you what it is beyond family. Unless you have a picture that lets us count the toes of your beetle, we’re not much help. You need to figure out how they’re getting in, which is difficult to do with a photo tour. And it’s even harder, if you (the picture taker) don’t know what kinds of lines of evidence to look for. Bugs are small and they have crafty ways of getting in. Sometimes it’s not even your fault – some beetles might be living in the flour or chili powder you picked up from the grocery store. You also need to know a bit about the local biological quirks (e.g. pesticide resistance), which involves tests we’re not equipped to do in our apartments. To put it another way, you really need boots on the ground to properly help someone with these sorts of problems. There are also legal issues with helping out, and without the sort of information above…this exposes us to liability. We don’t really want to be sued. We want to help people, but we have to be very careful about giving the wrong advice. So when we respond to these emails, we tell them how to find specialized experts which deal with this. Again, the specifics are a bit further down. In addition to incomplete information, and some legal issues, there’s also the question of health issues related to treatment advice. Using pesticides around the house isn’t much different than owning weapons. When used and stored properly, they’re very safe. When misused, people die. 2.) Mental illness is very real, and is a lot more common than people think. An example of a message Joe received which is typical of Munchausen’s syndrome. This is something which is very common, and Joe loses a lot of sleep over this sort of thing. To be fair, there are entomologists who freely give this sort of advice online. We want to unequivocally say that we believe this is not only unprofessional, but potentially dangerous. There are certain mental illnesses which cause people to believe that they’re infested with insects, and this causes them to treat their living spaces with pesticides. One symptom of pesticide poisoning is the feeling of a crawling sensation, which causes them to believe the ‘infestation’ has gotten worse, and this causes them apply even more pesticides. Encouraging these people to treat their living spaces with pesticides can put them in real danger, and we see this situation all too often. It’s something which deeply bothers us. We want to be very clear on this point: we do not assume anyone who emails us with infestation questions has any of these conditions. The ones who do have these conditions are people who are legitimately suffering, and they do need help. They are often well educated, highly intelligent, and well spoken. Unfortunately, we are not qualified to provide this sort of help. Most of the time these people need to be convinced to see mental health experts, instead of entomologists. There’s a stigma connected to mental health issues, which makes this a very difficult decision for them. Often that decision can only be made with the encouragement and support of the victim’s family, which is not a position we could be in for any of these messages. Thus these cases are often heartbreaking, and are usually impossible to handle in a manner which won’t make the situation worse. Of the cases that do deal strictly with insects, entomology is a *HUGE* field, of which pest control is only a small portion. Everybody has their own narrow field of expertise, and it makes sense to help people find one of those experts who specializes in this narrow area. We strongly believe that pesticides should be applied only under the supervision of qualified experts using the best information available to them. Since we don’t believe we can get the best available information through online interactions, we very strongly feel that it’s unethical to give specific treatment advice about infestations. However we do feel comfortable telling people how to identify their pests, what steps they need to take to make it hard for pests to establish, how to find someone who can treat their houses, and how to prevent re-infestation. So if you believe you have an infestation…here are the steps I tell everyone to follow online. 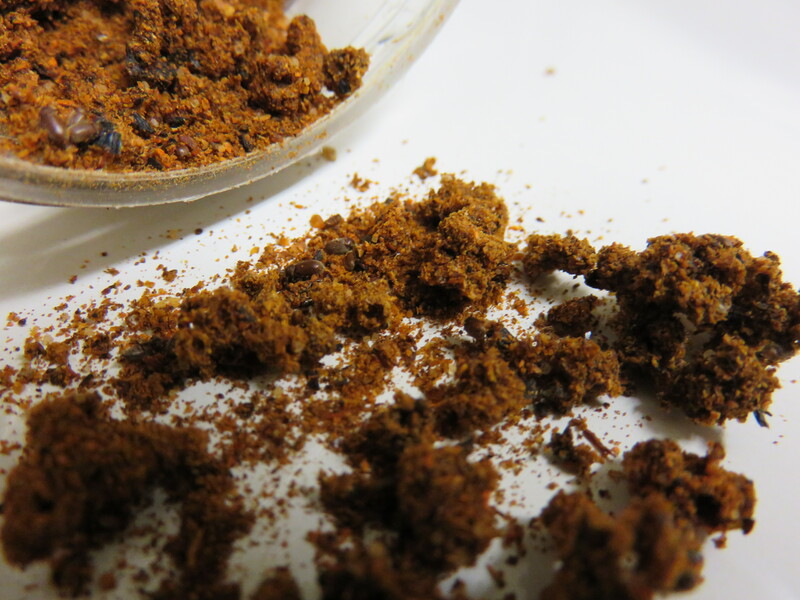 Signs of a cigarette beetle infestation in chili powder. The larvae live in silken sacs spun inside the spice, which they eat as food. Figuring out what kind of bug you have is the first step in determining what needs to be done in order to eliminate it. Even amongst groups of closely related insects, like the cockroach pictured at the beginning of the post, biology can vary widely. Since biology can vary, so can treatment options. For example German cockroaches are very hardy, but Oriental cockroaches need constant access to water. Surinam roaches won’t infest unless there are plants to nibble on, and they usually take up camp in potted plants. So each of these cockroaches need very different treatment techniques. They’re easy enough to identify using pictures of adults, but some insects aren’t as easy. In some cases, you need to mail an actual specimen to someone with a $10,000 microscope to correctly identify the bug in question. We’d like to be packing that kind of equipment in our apartments, but sadly we don’t have that sort of stuff…yet. We’re willing to take a look at any picture put in front of us, but we can’t always provide a proper ID. We don’t want to give the wrong information, so for infestation cases we usually recommend running a specimen by a urban pest specialist (called Urban IPM Extension Entomologists) working at a local university to confirm the ID. The National Pesticide Information Center, a collaboration between Oregon State and the EPA, has a really easy to use website which will help you find these sorts of local experts. The website can be found here, and we’d be more than happy to help you navigate it through email. Seriously…just ask us, and we’ll walk you through it anonymously. We’ll never mention your name in public. It’s what we’re here for. 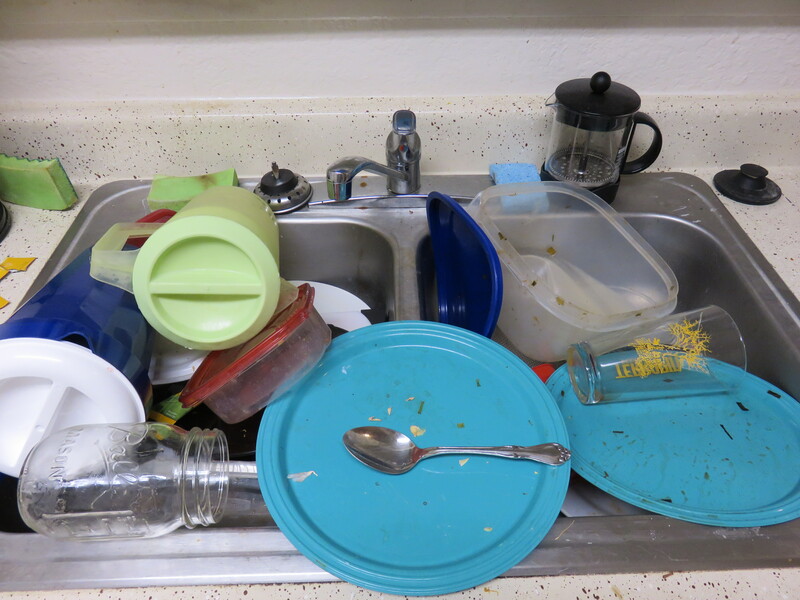 Joe’s sink after a weekend of eventful cooking. If you get busy and forget your dishes, expect flies after a few days. Flies tend to breed in trash, or sinks which accumulate matter. Empty your trash, and scrub all the cans. Clean out your garbage disposal, as well as the toilet. Damp areas underneath sinks are great places for drain flies, especially in older buildings where the piping isn’t insulated well. Check all window wells and crawlspaces for dead animals. In my house flies tend to breed in the gunk at the bottom of trash cans, or sometimes in bananas I bring home from the grocery store. So you can be somewhat clean and still get flies…it just takes one overlooked mess. Once you clean up the mess though, they’re usually gone in a week or so. A lot of beetles live in stuff like pancake mix or flour. Some live in spices, particularly chili powder. 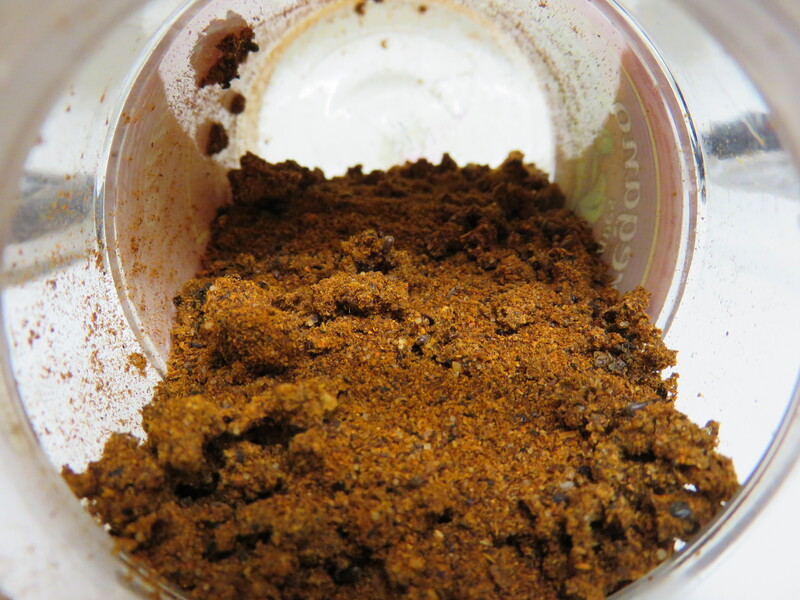 If you see small red or brown beetles in your pantry, check your flour and spices for signs of activity. Throw out anything that’s infested, and ‘quarantine’ any other potential food sources by sealing them in an airtight container or plastic bag. The USDA sets limits on the amount of insect parts acceptable to be in food, and these limits can be found here. Infestations during processing are nearly impossible to eliminate, and a lot of these insect parts come from small amounts of live insects. So don’t let your flour sit around for a long time-or better yet-freeze it for a day or two after you buy it if you’re really concerned. Ants are pretty unique amongst insects because their behavior is key to solving these infestations. They follow chemical trails back to a central nest, so you need to figure out where they’re getting in because killing the workers won’t solve your problem. This can be accomplished by following the workers back to the point of entry, and sealing the point of entry. The colony still needs to be eliminated in many cases, because they can just burrow in at another point. Some ants, like carpenter ants, are living in your house as a satellite colony while their main residence is hidden somewhere in your backyard. Even amongst ants, biology can vary widely enough to make nearly every species a unique situation. Again, it’s why a proper ID is needed. Some infestations, like fleas, bedbugs, or termites, won’t be helped by general cleanup. Bedbugs and fleas are feeding on you or your pets, and termites are eating your house. These animals need to be dealt with by a trained professional. Pest Control Operators, PCOs for short, apply pesticides for a living. Cracked, of all places, has a very good article about what PCOs do from an insider’s perspective. I highly recommend reading it before continuing, because it’s better than anything I could possibly write on the subject. PCOs, in general, are highly trained professionals and are almost always very good at what they do. I criticized some earlier for being (in my opinion) a little overconfident, but that criticism aside, I have never had an interaction with one which didn’t leave me confident of their skills. However, we’ve heard some horror stories from talking with Urban IPM Extension Entomologists. I’d work closely with one to find a qualified pest control operator. It’s a bit like finding a doctor you trust. Ask them some question to see if they understand biology of insects before you let them just have a go at your house. Here’s that NPIC link again-and again, we’re willing to help you navigate that page if you have any trouble. I also want to return to the topic of pesticide use, because I want to clarify how I feel about the topic…and avoid scaring people. A comparison of commonly used household pesticides. The dose required to kill 50% of female rats is given in terms of mg pesticide/kg body weight. The smaller the bar, the more toxic the pesticide. 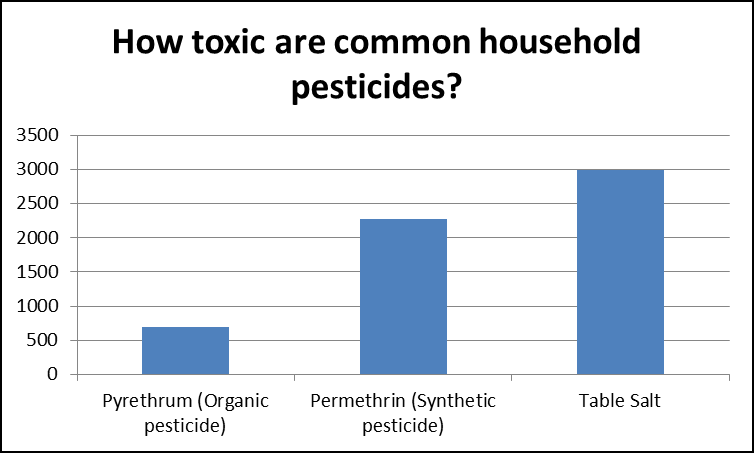 Neither pesticide, pyrethrum or permethrin, should be considered as particularly toxic. Pesticides can be dangerous, but the trick is to know which pesticides to use and how to use them. Chemical companies, for all their faults and mistakes, have actually gotten very good at producing selectively toxic insecticides. They do this by fiddling with different groups on the compound to find a combination that’s good at gumming up the inner workings of bugs, while being bad at gumming up the inner workings of people and pets. As mentioned in the Cracked article, most modern insecticides used around the house are actually about as toxic as table salt. If they’re derived from natural products, like permethrin, the natural alternatives are often more toxic. Plants tend to be less concerned with what they’re killing than chemists, and chemists only want to make chemicals which rid ourselves of specific pests. So pesticides can be used safely around the house, if they’re used properly. Proper use is the key term here, and I really want to drive this point home as much as possible. When pesticides are used in the home, the least toxic option should always be used. They should never be applied around food*. If they’re applied around living quarters, they should be applied in a way that guarantees that contact with the pesticide is limited. There are still long-term effects to consider, many of which aren’t very well understood. This is why I take safe use of pesticides very seriously, and choose to leave this sort of advice to pest control operators. I always encourage my colleagues to take this approach, as well. You should feel free to politely ask PCOs questions about what they’re doing, and run any answers you’re unsure about by an Urban IPM Extension Entomologist. If you do have an infestation, and you have called the professionals, and your problem is gone, you should ask follow up questions. How can you prevent this from happening again? In many cases, routine maintenance is enough to ward off the problem. Sealing leaks, creating barriers, keeping your kitchen clean, and monitoring and medicating pets are all things you can do to prevent this from happening again. Pesticides, if they have to be used, shouldn’t be a thing that you use in your house 24/7 until you move. They’re meant to get the current problem under control. Therefore, understanding the pests that you’re likely to encounter and understanding their basic biology will help you prevent outbreaks in the future. We’re here to help you. We really are. Cockroach found in Joe’s apartment last week. It’s a species which can’t live in his house, so there’s nothing for him to worry about. However, there’s a certain amount of professionalism which comes with the responsibility of our jobs. There are legal and ethical considerations which we can’t take lightly, and we would be a very bad source of advice if we did not take these considerations as seriously as we do. So, to a certain extent, our hands are a little tied in terms of what we can say about any particular situation. That being said, the first thing you need to do is to identify your pest. There are also a lot of things you can do to help clean up your house, and these alone can take care of a lot of infestations. There are also free or low-cost resources available to you through your local university extension office…and here’s that link again. Although we can’t give explicit instructions due to a lack of information, those guys are in a much better position than we are to help you out. …and again, we’re more than happy to help you navigate that website. We do not run the website, but we can help you find the information you need if you’re stumped. This is the view from Joe’s front door. He literally lives in the middle of nowhere, which lets him get acquainted with the local bugs. As for that cockroach at the beginning of the post…there’s a very important message in that picture, which hits on a very important piece of information I haven’t mentioned yet. Most insects are not capable of living inside our homes. That cockroach is a wood cockroach of some sort, Parcoblatta. They’re very common around where I live, because I live in the middle of the woods. The adults need a very moist environment to breed, and only leave logs to disperse. They also eat fungus inside the logs. The level of moisture they need cannot be found inside my home, and they cannot find a proper food source in my home. So I’m not dealing with an infestation, fortunately. 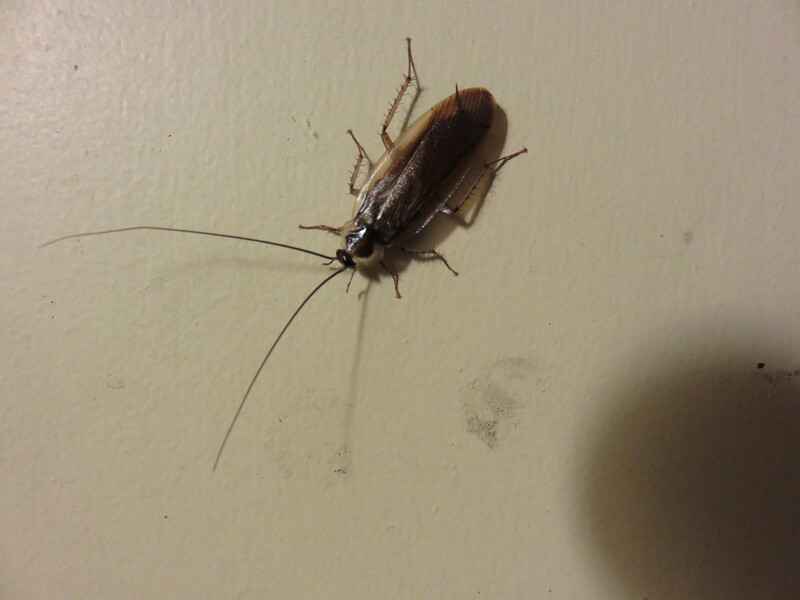 The roach probably came inside when I returned from a jog, because he was attracted to a light next to my door. 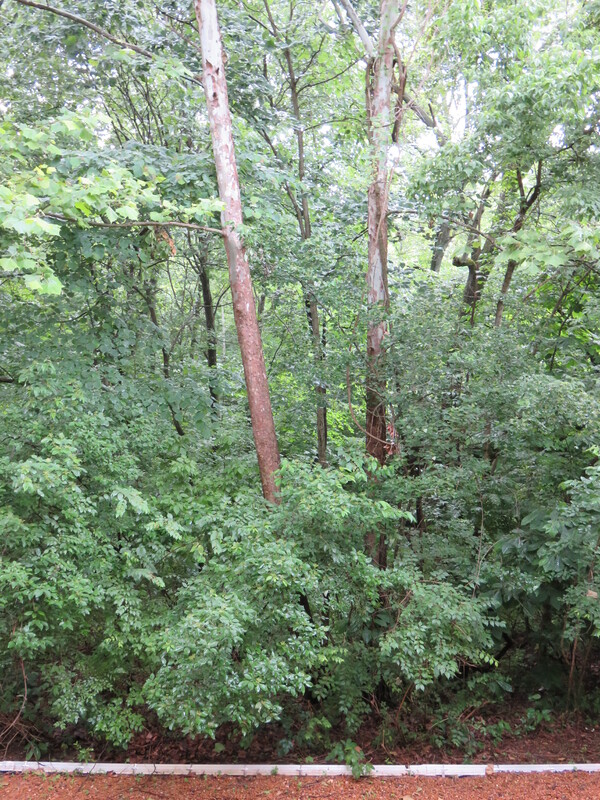 I didn’t want to risk killing or injuring the cockroach to ID it to species, so he was dealt with in the only manner I thought was appropriate…I took him to the edge of the woods, and let him go live his life and father a new generation. Full disclosure: Joe Ballenger works as a contractor at a large agricultural company which sells pesticides, including some of the chemicals mentioned in this post. He works in a research position, and does not receive any sort of commission for sales. He has never worked in the Urban IPM industry. Nancy Miorelli currently freelances and isn’t affiliated with any major cooperations. Her master’s thesis was on Integrated Pest Management in school and creating educational materials for teachers and lesson plans for students. More information about this project can be found on her website. *Pesticide application in an agricultural situation is very different, because the pesticides are given time to break down before harvest and are monitored to ensure that consumers aren’t exposed to harmful levels. Information about how pesticides are monitored can be found on the EPA website. This article by Anastasia Bodnar sheds a lot more light on the topic. This entry was posted in Behavior, Culture, Ecology, Pest Management and tagged ants, Beetles, Bug, Bugs, Cockroaches, Fleas, Flies, Infestations. Bookmark the permalink. 7 Responses to How do I deal with an infestation? Ladybugs are generalists and they’ll pretty much shove whatever they can into their face. Cockroaches have gradual development and start off really small. So if an adult ladybug ran into a little baby cockroach, I wouldn’t be surprised if the ladybug ate it. Though it may be any type of pest, they are very annoying. Once pest made path to your home then it becomes really very difficult to eradicate them. I know I have carpet beetles and powder post. I am in search of an entomologist in my area and someone to handle my infestation. I’ve seen the damage, found the bugs and I’m not a mental case. I don’t have itching all over, none really My question is I think I have larva in my eyebrow pores and right under my skin on my body. on my body it first comes off like a skin flake and the there is this white spec. Kind of follows a line. Has this ever been noted?